Welcome to day 28 of 30. I am sure you have been waiting for seemingly forever for this post, as I have been unable to post for the past couple weeks. Strangely, work and family life came first, and finding the time to sit and get my thoughts out while we were in Russia got tougher and tougher each day. So this is indeed "day 28", it just isn't sequential days. Sorry for the delay, now let's get to it! Last post we looked at a couple of roasting impacts on coffee, with the focus on physical changes that take place. It was a simple approach to roasting and certainly not meant to be a comprehensive lesson on how to become a roaster. The reason has to do with the method we consider standard for measuring coffee in the specialty industry. If you can't guess, I am talking about gram weight of the coffee dose. Many of you consider the gram weight to be the primary measurement of importance when making coffee. This has become standard for espresso dosing as well as filter brewing. You weigh the coffee either before or after grinding and calculate your recipe based on the weight of the initial dose. But the bean density tells us a slightly different story. Each of the cups above has exactly 55g of coffee by weight, but between the light roast and the dark roast we have almost double the amount of physical coffee matter. If you were to brew a batch of filter coffee with each of these using the same ratio of coffee to water (let's say 1:16), you would probably find that the lightest roast is just about right (maybe a little thin), and the darkest is too strong. I'm sure many of you are already thinking you would never brew such a dark coffee as the sample on the left. While these examples are pretty extreme, these variances still exist within "specialty coffee" roasts. They are sometimes just more subtle, though there is no regulation on what is proper roasting so you never really know. This is why it is almost impossible to give blanket advice in the form of "just use a 1:16 ratio and you will get great results!" Even the difference between the middle and right cups, though the color looks very similar, is a significant amount of coffee matter. Where this does have an impact on you, miss/mr specialty barista, is in the density measurement. A dark roast is an easy example of low density coffee, but there are other ways to demonstrate this, especially based on elevation and climate conditions, but also varietal and processing method. Traditional Brazilian coffees tend to have lower density, as do ripe natural processed coffees and varieties such as maragogype. Maragogype is also a very large sized bean, which adds another factor. There is never a rule, but these are common examples. On the high density side, washed processing, high elevation, cool climate, and varieties like Ethiopian "heirloom" (which is a combination of smaller average size and typically high density) all tend to result in a more dense coffee measurement. When it comes to using density as a measure I want you to consider how much physical space is being used and let it help you with your brewing. There are some other factors at play with density, but I will leave those for another time. For now let's look at how to fit our understanding of density into the brewing process. First, let's start with filter brewing since it is a little more straight forward. When brewing coffee with a pour-through method, the combination of grind size and amount of coffee matter have the biggest impacts on how quickly the water will flow through the slurry and out into the brewing vessel. There is plenty to be said for the amount of fines and other details, but that is a discussion for another time. I think you may already see where I am going with our density measurements in relationship to filter brewing. If the amount of coffee matter in the cone is one of the biggest impacts, any density variables will change the amount of coffee matter! These details probably won't hit you hard in your cafe where the coffee is always sourced and roasted similarly, though it may help you problem solve some coffees such as Brazils or other low density specialty beans. It should definitely impact your bigger picture of the coffee world, where there are countless variations on roasting and sourcing. You simply cannot just pick up any beans around the world, apply the exact same recipe or method, and expect excellent results. 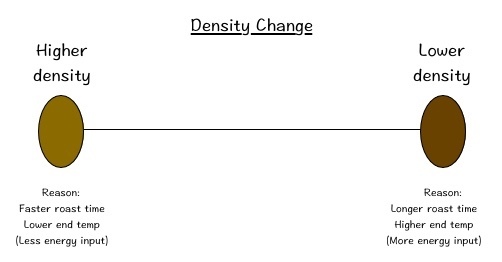 In addition to changing the speed of the brew, your ratio is essentially different between density levels. There is more coffee matter to absorb water and more surface area to extract from, which means you may be making an off brew. Maybe this can help you solve why your TDS readings are where they are? Next, let's talk about espresso. This is where we have a little more impact to the brew. Just like with filter brewing, grind size and the amount of coffee matter directly impact how quickly a shot pours. Unlike filter brewing, just a couple seconds of difference can have a massive impact on the shot's flavor. Since the standard dose for espresso is considerably smaller, and we have a rather fixed space in which we can brew, variances in the coffee density tend to have much more significant impacts. For example, if a 20g dose is just right with your "medium" roasted coffee, 20g of a darker roast might force the coffee puck against the shower screen as it expands while brewing (which I believe is NOT a good thing). So already density in espresso is big, but we also have those same shifts in ratio, extractable surface area, etc that are impacting the espresso extraction. When you encounter an uncommonly high or low density coffee, expect to adjust the dose amount up or down. Higher density coffees may need a little more of a dose (or finer grind), and lower density coffees may need a lower dose (or coarser grind). Your brewing ratio may stay the same with similar roasting, but if you encounter a darker roast you are likely going to need more water and less coffee by weight. There are a lot of variables that are impacted by something as simple as density variance and it is impossible for me to cover them all in a single blog post, but these basic understandings should help you master your coffee just a bit better. Thanks for waiting for this post, your patience has paid off. Posted on October 23, 2017 by Pete Licata and filed under Blog and tagged Bean Density Brewing Espresso Roasting.